(Newser) – Don't say science never did anything for you, spicy food lovers. 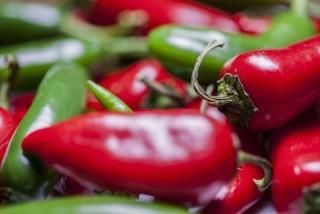 Last week researchers published the full genome for the hot pepper (Capsicum annuum), a discovery that, according to LiveScience, could have a very practical application: even hotter peppers. The findings will "help breeders accelerate the research of new breeds by molecular biology techniques," one of the paper's co-authors says. Researchers analyzed 18 cultivated peppers and compared them to their wild counterparts, identifying genes associated with a host of characteristics—including spiciness. What? We gonna end up with hotter and thicker skinned peppers, like they did to tomatoes? Watch out...another franken-food coming our way. Peppers have been bred by agronomist for nearly 15,000 years. They are a native American food that have spread world wide, where many such foods don't have relatives that look anything like the current "food." (Versus wheat or barley from the Golden Cresent where you can find "wild" varieties that really look like there modern varieties.) I prefer my foods from an actual grower over a "scientist." Scientist makes foods more like health professionals make for hospitals...nothing one writes home about loving.